Hybrids – and plug-in hybrids – may not be firing the imagination as they were a while ago, certainly not now at a time that crude is priced as it is. There’s however no denying that they’re very much integral to expansion plans for many an automaker as a means of providing alternatives for those looking for such alternative fuel offerings down the line. Deploying more of them is also a means to refine the tech. Mercedes-Benz is one of those set to get into the thick of things, especially down the plug-in path – the company is planning to introduce no less than 10 models of the variety by 2017. 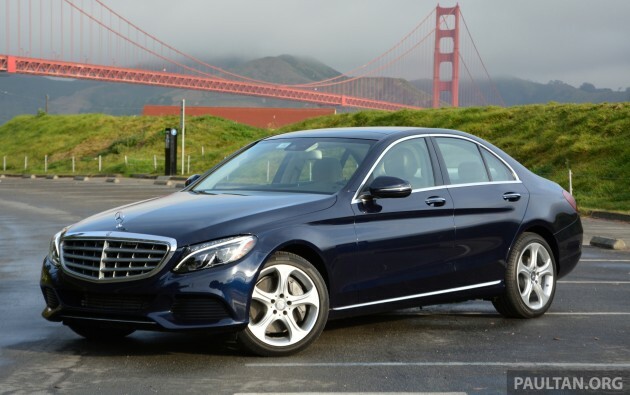 The first to come about was the W222 S-Class variant, the S 500 e Plug-In Hybrid last year. 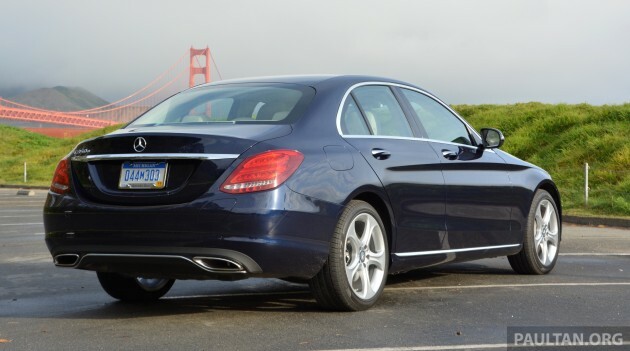 The second was trialled during the recent Intelligent Drive Experience 2015 showcase in San Francisco, where the first media samplings of the F 015 Luxury in Motion concept took place – the event also saw a drive session with the latest W205 C-Class variant, the C 350 e Plug-In Hybrid. The car was announced at the international media drive of the C-Class in March last year and officially broke cover in January, but is only now making its market debut in Europe. 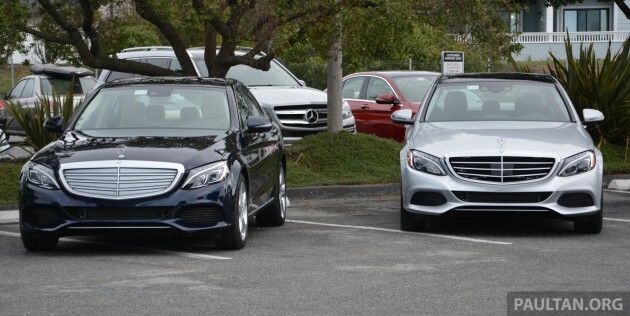 The C 350 e is the second hybrid in the model range (the first was the C 300 BlueTEC Hybrid) and the second Mercedes plug-in after the S 500 e that was introduced late last year. Available in both sedan and estate body styles (the latter was showcased as a display vehicle outside the event hotel in SF, alongside a mint-looking 190 E 2.5-16 Evolution II), it’s equipped with the same 2.0 litre petrol unit as seen in the regular C-Class, with a 60 kW motor added into the mix. Here, the M274 DE 20 AL runs with the same output tune seen in the regular C 250, with 208 hp and 350 Nm for numbers. The 80 hp motor, meanwhile, is good for 340 Nm of twist, and the combined power output is rated at 275 hp and 600 Nm. Power is driven to the rear wheels via a seven-speed 7G-Tronic Plus automatic transmission, which features a hybrid module incorporating both the electric motor and an additional clutch between the combustion engine and the electric motor, the clutch here being a substitute for the torque converter. 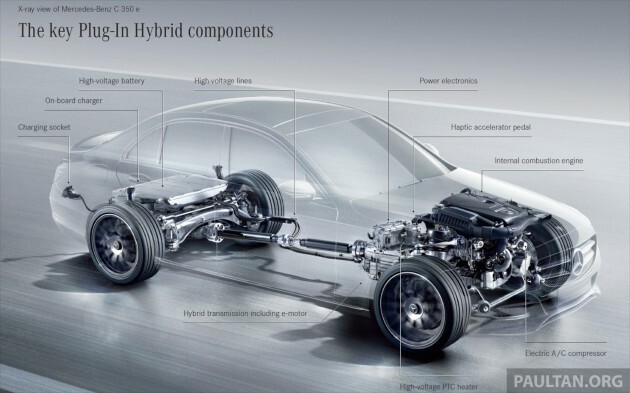 When driving in all-electric mode, this decouples the combustion engine from the drivetrain. It also offers the possibility of moving off using the combustion engine, but with the performance of a wet start-up clutch. Performance numbers include a 250 km/h top speed for the sedan and 246 km/h for the estate (the C 350 e can run up to 130 km/h on electric power alone) as well as a 5.9 seconds 0-100 km/h sprint time (6.2 seconds for the estate). Fuel consumption is a heady 2.1 litres per 100 km combined, and C02 emissions is a claimed 48 g/km. 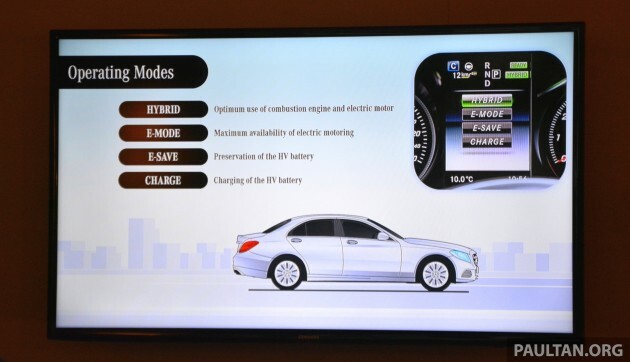 The range of operation in all-electric mode is 31 km, two less than the S 500 e. The electrical energy storage unit consists of a high-voltage lithium-ion battery with a total capacity of 6.38 kWh, located at the rear of the car. The 100 kg water-cooled battery is mounted in a sheet steel housing underneath the rear axle in order to maximise crash safety, driving dynamics and boot space. Speaking of boot space, despite volume taken up by the battery, the C 350 e’s rear still offers a very usable 335 litres of cargo carrying capacity in the sedan – the estate offers 350 litres, and with the rear seats folded down, 1,370 litres of cargo space. The battery can be recharged from an external power source in around one and half hours via a wallbox or through a 230 volt/16 ampere 3.7 kW single-phase public charging point. The charging port, a SAE J1772 connector, is located on the right side of the rear bumper. The car can also be tanked up via a domestic power socket, with a charge time of around two hours running off a 230 volt/13 ampere 3.0 kW single-phase supply. Of course, there’s also the ability to juice up the battery to its maximum via the engine while on the go, though the commute has to be long enough to do so. 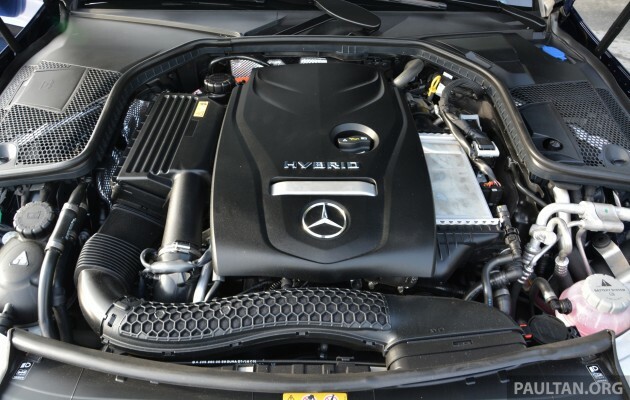 The tradeoff in going the plug-in route is in terms of weight, and so while output numbers might be up, these have to push a heavier car – the C 350 e tips the scales at 1,705 kg, 270 kg more than a standard C 250 (1,435 kg). 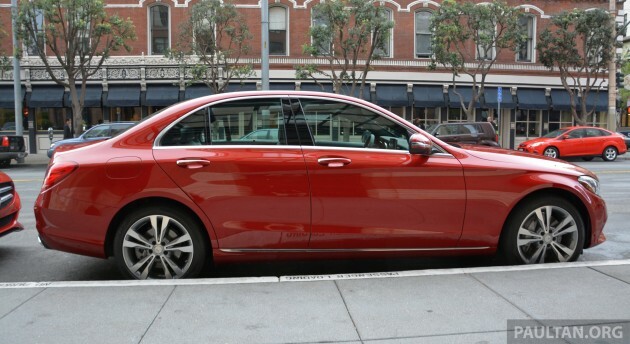 The C 350 e is equipped with an Airmatic self-levelling air suspension as standard, a feature up than the regular C-Class offerings, where the system is an option. Like its regular C-Class siblings, the C 350 e offers user-selectable transmission programmes (Individual, Comfort, Eco, Sport and Sport+). In Comfort, the boost power and energy recovery are optimised for comfort and consumption, with electric drive/engine shut-off possible up to 130 km/h. As for Economy mode, the boost power is consumption-optimised, with energy recovery minimised in favour of the coasting distance. In addition to the selectable transmission programmes, there are also four operating modes to influence the regulation between electric mode and use of the engine for driving. Switching between them is only available when Eco and Comfort modes are selected; in Sport and Sport+, the only mode available is the primary one, called Hybrid. Here, all hybrid functions such as electric operating mode, boost and recuperation are available and are applied according to the driving situation and route in the most fuel-efficient manner. The next is E-Mode, used for all-electric driving, for example in inner-city areas, when the battery holds sufficient charge to be employed. The third is E-Save, where the charge status of the battery is maintained – the driver can use this to save the battery power for all-electric driving in an environmental zone at a later stage in the journey. The mode naturally limits electric driving and the boost function. As for Charge, this works as stated – during driving, it allows the battery to be recharged via the combustion engine so as to store up a higher state of battery charge for use in later parts of the journey. The engine remains switched on in this mode, and electric operation is disengaged. Like the S 500 e, the C 350 e is equipped with a haptic accelerator pedal, which aids driving by means of information to the driver via pulse feedback. For example, in electric mode, the pedal begins to pulse when the driver’s foot meets a point of resistance on the accelerator pedal, an indication that maximum electric performance is being delivered – if the driver continues to depress the accelerator beyond this resistance point, the combustion engine will kick in. In Eco mode, with Eco Assist engaged, the haptic pedal also delivers a signal suggestion (a double pulse) to the driver to remove his foot from the accelerator pedal in order to switch off the combustion engine and decouple it from the drivetrain in situations where it is optimal to do so (downhill, optimising energy recovery). Some quick notes about the trim available for the car, which rides on 18-inch wheels and 245/40 rear and 225/45 front tyres, in the case of the demonstrator, Pirelli P7 Cinturatos. As standard, it’s available with an Avantgarde exterior equipment line, though the car can be specified with an Exclusive exterior at no extra cost (our mule was an Exclusive unit). In terms of assistance systems, that seen on the regular C-Class is found here on this one, with Attention Assist and Collision Prevention Assist Plus included as standard fit. The C 350 e also comes equipped with a pre-entry climate control function as standard (also seen on the S 500 e) – the system makes it possible to set the desired temperature for the interior of the vehicle before a journey, cooling it in the summer or warming it up in the winter. This can be done by pre-setting the departure time, either in the vehicle or from home via the Internet. Temperature regulation is accomplished via engaging the electrically-powered refrigerant compressor or electric heating elements, depending on what’s required. If the tech above suggests that there’s plenty to digest, the truth of the matter is that running the C 350 e isn’t as complicated as it sounds – approach it much like a regular C-Class, because for the most it behaves and feels just like one. Some thoughts about the off-the-line performance though, which we’ll get out of the way first. Despite the impressive output and performance numbers, the C 350 e didn’t feel blisteringly fast off the line – it wasn’t sluggish by any means, but the application of power felt more linear and civil than progressively breathtaking. In short, there’s simply no fanfare. Granted, the route – which was a loop downwards to Woodside via Half Moon Bay and then back to San Francisco via the Interstate 280 – didn’t offer many chances to stand on the pedal from the get-go, what with the speed limits and endless stop signs on call, but the feeling is that this isn’t quite the right face if you’re looking for a traffic-light barnstormer (which of course it isn’t and shouldn’t be seen as). At some points, the car came across as heavy as it was. No such complaints about the midband and the workings of the motor once you’re up to some decent pace – there was a good stretch of twists and mixed level terrain before we hit the highway back to SF, and the C 350 e felt vibrant enough tackling these. The extra mass doesn’t make it as lively and engaging as say the C 250 chassis-wise, but it’s nonetheless competent. If there’s an item to nitpick about, then it’s the engine, which feels a fair bit rougher and louder punching up the speed register than its regular petrol-only sibling. It’s not a deal breaker, this, but it does take away some of the gloss obtained from the car’s electric operation, which is absolutely first-rate. Coming in from something rather basic like the hybrid system found on the E 300 BlueTEC Hybrid and the limited operational scope brought about by its small battery, this one feels light years on – motor to engine transitions are smoother, and the range of delivery (and usability) far eclipses that of the standard hybrid. The point about there being no replacement for displacement also holds true in the case of batteries. For a good part of the longer second-leg of the drive, the car was left to run in its Hybrid mode, and performed comfortably; battery power only dipped once to a state of a recharge being triggered – the drop to this 10% cutoff point took a while, and regenerated to mid-capacity levels in decent time. 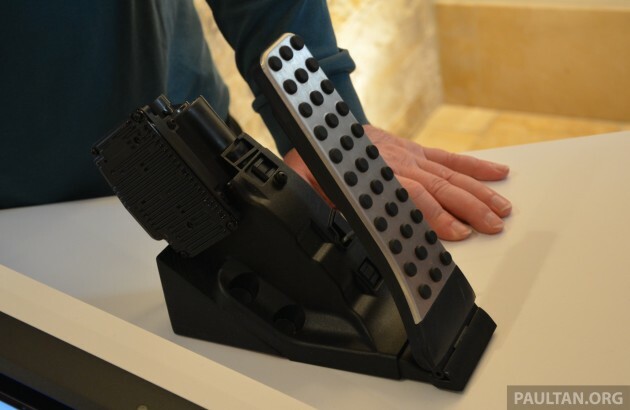 Plus points for the haptic pedal, which was a boon to use and is eminently more workable as an eco-driving aid than going the usual metered route. 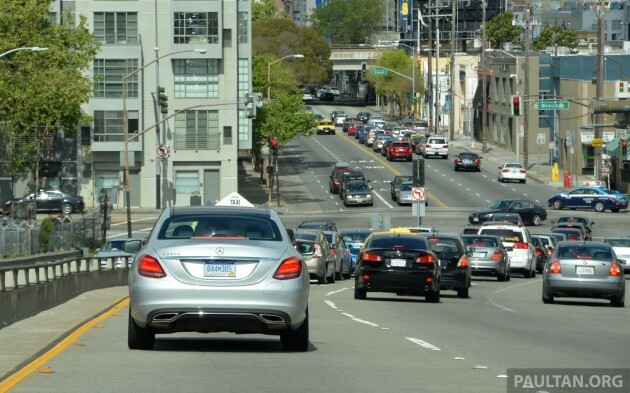 I decided to see just how accomplished the all-electric operation was in a heavy-traffic urban environment, and on the long Junipero Serra Freeway return leg to San Francisco left the car on its Charge mode to juice up the pack. By the time we arrived at the fringe of the city the battery was at 100%, and heading into the start of traffic, E-Mode went on. The final nine kilometres going towards the Embarcadero was made purely on electric power, the 25 mins of travel going through heavy stop-start conditions, a multitude of traffic lights and plenty of idling time – by the time we reached the stop, the C 350 e’s battery still read a 61% charge, and not once had the engine threatened to kick in (the car even managed a rather steep and long highway ramp at 60 km/h without the haptic pedal coming close to triggering any impulse feedback). That urban run showed the tech to great effect – if such conditions were a regular feature, the C 350 e makes a compelling case for going the plug-in hybrid route in the premium exec segment if such an argument were to arise. Sadly, we’re not going to see the tech here anytime soon, at least not in the form of the C 350 e – word is that Mercedes-Benz Malaysia has no plans to bring it in. A shame, but that’s how it rolls sometimes. UPDATE: Looks like we spoke too soon. Mercedes-Benz Malaysia has since announced that the C 350 e will be launched here soon, with an estimated price of RM299,000. Its a really cool system though! Having said that, one potential issue would be the Airmatic rear. Airmatic and reliability don’t fall under the same category, and replacing it won’t be cheap. Agree. But it does say that the Airmatic is an extra option. Plus, I’m sure it has been put through under lots of rigorous testing before this. As long as the system holds up while the car is still under warranty, then it should be fine. Never buy German except for sausages. German cars are well known for their reliability issue, just look at VW. Buy Toyota better, good RV. Latest Camry hybrid got you conti quality with Malaysian price. You like german sausages? Japanese sausages too small for you? That explains a lot about you sausage boy! Nah! European cars still lead the way in terms of technology and refinement. The Camry (which is NOT a Lexus GS in disguise by the way), is by no means a bad car at all, but it is no comparison to… let’s say the Passat or the Mondeo, let alone the Mercs and Bimmers etc. That’s why Toyota came up with the Lexus brand, which has with their cars what you refer to as “conti quality”. Like you said, the Toyotas have slightly better RV and perhaps that little bit more reliable… and that’s about all to be honest. Have you encounter any reliability issue of VW so far? every car is facing reliability issue, it just depend on how the owner take care of his car!! !